Before having kids I didn’t really give much thought to how working parents juggled looking after – and as well as, entertaining - school-aged kids during the school holidays. When I was younger and my Mum was working, my sisters and I were fortunate enough to be able to hang out with our Nanna who lived with us. 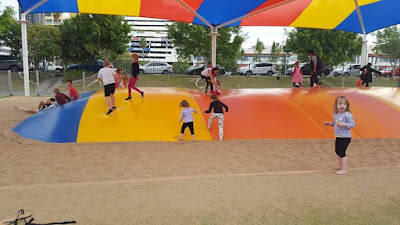 We spent school holidays riding bikes around the neighbourhood, playing netball, movie and roller skating dates, trips to the local shopping centres, sleepovers and more. I was a Brownie and Girl Guide in my younger years (PRETTY sure I was the first girl in Australia to receive the Asia Pacific badge back in the day! ;-) so enjoyed a couple of short camps that were so much fun. 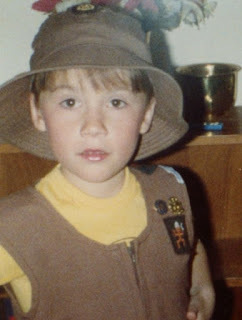 Me back in the day as a Brownie. 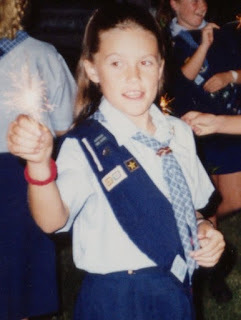 Me back in the very early 90s as a Girl Guide. But after having watched too many American TV shows or movies and read too many American tween and teen books, I really wanted to experience ‘Summer Camp’ – an extended trip away camping (or in cabins) to enjoy spending times with friends, learning new skills and participating in fun/challenging activities. I’ve had friends who have worked at these and had the time of their lives! Sounds like something my little ones will enjoy as they get bigger! These past school holidays I juggled my work commitments – working as a consultant and freelancer and helping current and new clients – as well as taking on a super exciting new gig as Editor of a monthly magazine here on the Gold Coast (will share further details with you in an upcoming post, I promise). I had Miss 6 home with me during these recent school holidays and she enjoyed a sleepover at her Nanna’s and a day out with a friend from school (they went to the movies, accompanied by the friend’s mum, and also had manicures! How cute!). Miss 6, Mr 4 and my 2yo twincesses also enjoyed trips to the park and visits from interstate relatives. A few of my friends who work full time have to put their children into vacation care during the school holidays, or are lucky to have grandparents/aunties or friends happy to come to the rescue, and mind their children, for the whole school holidays. I recently came across Crusaders, also known as CRU Camps - a Christian youth camp who run holiday and day camps for kids and teens. They offer activities such as abseiling, rock climbing, canoeing and more. It looks like a great option for my friends’ kids and for my little ones when they are bigger! The team of young adults – who have all had the child protection screening checks in accordance with government child protection legislation - look after campers 24 hours a day, there’s a ratio of at least one leader to every five campers (amazing, this is more than school or kindy!) AND there are at least two leaders in each group with Senior First Aid qualifications. A camp ‘Mum’ and ‘Dad’ attend primary age camps to care for the emotional needs of young campers. How good is that! Check out their website www.crusaders.edu.au/ for further info about the fabulous camps such as Splash 2016 being held in September.An epic week of water and land action where attendees enjoy magical days on the lake canoeing and rafting, tubing around the beautiful Lake Macquarie with new friends. They’ll try fishing and awesome day and night wide games, water wars, chill out times, fun leaders, tasty food, a movie night and campfire. What did you get up to in the holidays when you were younger? What do you do with your kids in the school holidays? Do you take time off work?